Cut and Shoot, Gun Barrel City, Gunsight, Point Blank and Winchester, Texas. The stereotypical Texan is seldom gun shy when it comes to settling a difficulty with violence, a mythology reflected in the number of Lone Star communities with names evocative of rough and tumble ways. At least five such towns come to mind: Cut and Shoot, Gun Barrel City, Gunsight, Point Blank and Winchester. Of these Second Amendment-esque place names, Cut and Shoot has gotten the most ink over the years. Out-of-state journalists have periodically pointed to this Montgomery County community as having a name particularly representative of Texas’ supposed willingness to resort to violence. The story goes that the name came from an incident in 1912 that nearly led to bloodshed. Ironically, in all three versions of the tale, the triggering factor was an argument over church-related issues. Some said the intra-congregational tiff concerned the selection of a preacher while others later maintained the argument was over how the church steeple should look. The third version has it that the barely averted battle had to do with a despute among church members over land matters. While that may be the story, the simplicity of the name seems to belie that. In Texas, two of the three basic ways to resolve an issue involved cutting or shooting, the third being fisticuffs. Gun Barrel City is in Henderson County, about 20 miles northwest of Athens. As Texas towns go, it’s not very old, having started during the building of Cedar Creek Reservoir in the 1960s. Since then, you might say Gun Barrel City has grown faster than a speeding bullet, shooting from a population of 60 in 1970 to 5,000-plus in 2000. Many a barroom denizen has learned the hard way that gunpowder and alcohol do not mix, but Gun Barrel City was incorporation to facilitate the legal sale of beer and wine. The town got its name from its motto, “We shoot straight with you.” The town’s symbol, of course, is a rifle. But, as the Handbook of Texas Online points out, a roadway known as Gun Barrel Lane cut through the area well before the lake was there. Since the road represented a short cut from Mabank to Seven Points, the Gun Barrel descriptor might have had to do with its straightness between A and B.
Gunsight, a mostly ghost town in Stephens County with only six residents as of the last census, dates back to 1879. It was named for a set of low mountains that from a distance look like the V-shaped notch in the middle of a gunsight. A year afer its settlement, Gunsight got a post office which lasted it until the Breckenridge oil boom of the late teens played out in the 1920s when the Wichita Falls and Southern Railroad closed its station there. Point Blank is the range at which you want to shoot at something if you don’t want to miss. Point Blank is the name of a community in San Jacinto County, 85 miles north of Houston. Alas, the story behind the naming of Point Blank has nothing to do with shooting. A Frenchwoman named Florence Dissiway, while working as the governess for two branches of the pioneer R.T. Robinson family back in the 1850s called the settlement Blanc (as in white) Point. Leave it to Texans to corrupt that to Point Blank, which they did. Point Blank didn’t get its own post office until 1884 and slumbered along until the construction of Lake Livingston in the 1960s perked things up. But even after the laked fill and began to attract anglers and tourists, the 2000 population was only 559. One would think the Fayette County community of Winchester honors the weapon that won at least half the West, the lever-action repeating rifle generically known as a Winchester. But one would be wrong. 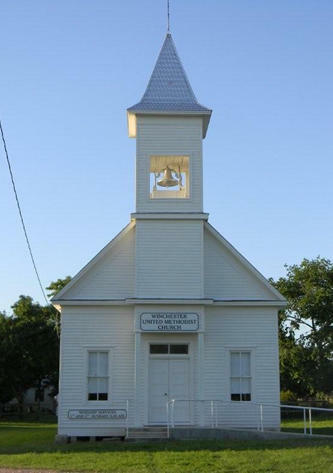 Located 20 miles northwest of La Grange on a tract of land first settled in 1827, Winchester, Texas was laid out in 1857 by John Gromme. By 1866 the community was of sufficient caliber to merit the opening of a post office. A farming town, Winchester boomed as much as it ever would when the San Antonio and Aransas Pass Railway came through on its way to Waco in the mid-1880s. Cotton being king back then, the communtity had 18 businesses by the turn of the century. But as cotton became less dominant as a Central Texas crop and better roadways made it easier for folks to trade in larger towns, Winchester whithered like so much long staple in a dry year. By 1950 the population had decreased to 220. Thirty years later it was down to 50, which was also the head count in 2000. Finally, for a time when it had the reputation of being a wild and wooly railroad town, Hearne was known as Six Shooter Junction. But that was only a nickname, nothing worth fighting over.